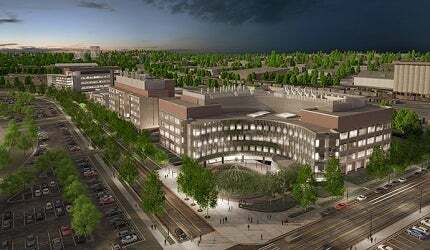 Artist’s rendering of the new Cancer and Cardiovascular Research Building. Image courtesy of Architectural Alliance. Construction on the new research building for cancer and cardiovascular diseases was started in May 2011. Image courtesy of Bergerson Photography. The new research facility can accommodate up to 25 lead cancer and cardiac researchers and their staff. Image courtesy of Architectural Alliance. Construction of the cancer and cardiovascular research building was completed in the first half of 2013. Image courtesy of Bergerson Photography. The Cancer and Cardiovascular Research Building at 23rd Avenue, south-east of Minneapolis, Minnesota, US, was officially opened in June 2013. The new facility focuses on the research and development of new treatments and therapies for cancer and cardiovascular diseases. The project was sponsored by the state of Minnesota and the University of Minnesota. The new research building was constructed as part of Biomedical Discovery District (BDD) project by the University of Minnesota. The BDD is a complex of research buildings, which accommodates researchers across the Academic Health Centre to work side-by-side. The BDD project was approved by Minnesota Legislature in 2008. The new research building can accommodate up to 25 lead cancer and cardiac researchers and their support staff. It is used to carry out research on biochemistry, which focuses on the role of chemical carcinogens in causing cancer. The researchers based in the building will prepare new models to find better cancer treatments. The research also studies cardiac regeneration and development, muscular dystrophy, congenital heart medicine and genomics. "The new facility is for the research and development of new treatments and therapies for cancer and cardiovascular diseases." The design of the new research building was approved by the Board of Regents’ Facilities Committee in June 2010. Architectural Alliance and Zimmer Gunsul Frasca (ZGF) Architects designed the new building. The façade and curtain wall of the research building is curved. The façade is also covered with brick and glass. The building also includes an atrium, skybridge, sun-shading and green roof. The new building has a total floor space of approximately 280,000ft² over five floors. It features shared research space, laboratory areas, researcher offices and public areas such as a café and a seminar room. The building features offices situated near the lab spaces. Researchers from the Lillehei Heart Institute and Masonic Cancer Centre are accommodated in the new building. The new building is fitted with state-of-the-art laboratory equipment. It has an attached vivarium and research space for chemistry, genetics and mouse modelling. "The new research building can accommodate up to 25 lead cancer and cardiac researchers and their support staff." The building has the most advanced laboratories, instrumentation and support facilities to carry out research on cancer and heart diseases. It also features high-end microscopes, centrifuges and MRI machines. Construction on the new cancer and cardiovascular building broke ground in May 2011. Approximately 55% of the construction was completed by May 2012. All building construction was completed in the first half of 2013. The University of Florida started construction of a new clinical and translation research building at its Mowry Road, Gainesville campus in Florida in May 2011. The building design was prepared by Architectural Alliance, a company based in Minneapolis, in association with Zimmer Gunsul Frasca (ZGF) Architects of Seattle. The building construction contract was awarded to Mortenson Construction. The contract for design and installation of mechanical systems in the building was awarded to Metropolitan Mechanical Contractors. The mechanical work represents about 30% of the building construction cost. The overall estimated investment for the construction of the building is approximately $200m. The state of Minnesota contributed 75% of the capital costs for the facility. The University of Minnesota contributed the rest of the investment. Telstar offers solutions and equipment with technology for chemical and biological containment: containment isolators, sterile isolators, weighing cabinets or RABs. GMP Technical Solutions was established in 2005 and is a leading turnkey solution provider for pharmaceutical and life sciences projects. We continue to maintain structured growth, which is reflected in our reputation of high-quality installations and standards of modular cleanrooms, HVAC (heating, ventilation, and air-conditioning) systems, cleanroom equipment and isolators, as well as laboratory apparatus.